Jon and I are having a little housewarming party next weekend, so I've been busy making lists and scouring Pinterest to get some ideas. I have been slacking with getting outfit pictures this week, so I thought I'd share some of my ideas for the party instead! Since we're doing an open house and people will be coming and going all day, we're planning on having a bunch of appetizers and finger foods that we can easily pull out or pop in the oven, like the ones below. For the main meal around dinnertime, Jon is going to barbecue up some burgers and hot dogs and we'll have pasta salad and potato salad. Time to hit up Costco this weekend! As far as drinks, we'll mainly be doing soda, beer, and wine. (Here's a good pin about how much to buy for 10-20-30 people.) We got these cute handled mason jars of Craigslist (like pin #2 below), which I think we'll use for spiced apple cider out of our beverage container. We may make a warm version, too. I'm not sure if we'll do the pumpkin cooler below but I think it is so cute and festive! So I am not sure how much extra decorating we'll actually be doing since we're still finishing settling in. 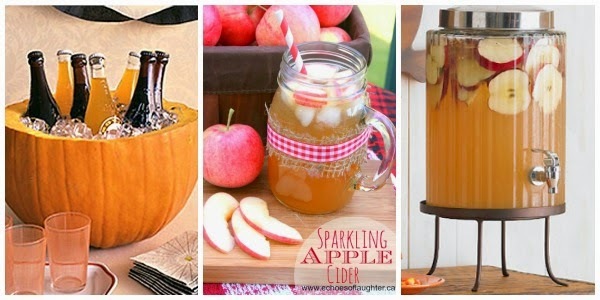 But these fall ideas below are really cute! Linking up with Claire Justine OXOX, That Friday Blog Hop, and Style Elixir.